Join us at the 37th Annual UFV Employee Fundraising Golf Tournament, to be held on May 13, 2017. 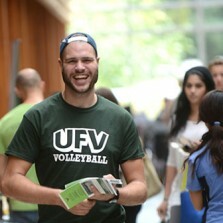 Make a difference, have fun and support students at UFV! Together we raised $4,350 last year for students facing sudden and unexpected financial burdens. Please help us raise $7,000 this year and have fun doing it! Registration is $60 per person and includes golf, lunch and a free bucket of range balls to warm up. This will be a team event using a Texas Scramble format with a staggered start. Tee times will begin at 9 am with lunch following your round. Registration is limited to the first 120 golfers, so be sure to register early! The tournament is open to all UFV staff, faculty, administrators, retirees, and their guests. Encourage your colleagues to register; challenge those in another department to put in a foursome — the more the merrier. Mulligan tickets are available to purchase online when you register or onsite. We will also have a 50/50 draw, a putting contest, chipping contest, draw prizes and more. Thirsty players will be happy to know that the beverage cart will be out on the course this year. And last but not least — trophies and bragging rights are on the line for the winning foursome. Who will it be this year? A limited number of Power carts are available for rental at $25 + GST each. Pull carts are also available to rent for $4 + GST each. Reserve yours by calling Cultus Lake Golf Club directly at 1-877-858-FORE (3673). Register today online or by dropping off your payment to the Advancement office (B310 – Abbotsford). Put together a team – have fun, win prizes and… help students! The tournament is once again being supported by UFV (Human Resources and Finance). If you wish to donate a prize or learn of other sponsorship opportunities, please contact Sheila.Reimer@ufv.ca. “I had a tumultuous upbringing that was rife with addiction and heartache. I became pregnant with my eldest daughter when I was fourteen years old. I got married at eighteen and had two more children. When my marriage dissolved two years ago, it became clear to me that I would need to support my daughters and that minimum wage was not going to cut it. In my everyday life I make a considerable effort to avoid using labels or making generalizations, but I am trying to make it clear that I have been fortunate. I know full well that there are many children and youth who, by no fault of their own, will grow up and not be able to overcome such challenges. I was a level 3, high risk, marginalized youth and teen parent with a lot of trauma who spent time in both group homes and foster homes. I had limited access to a social worker, which I now know was a violation of my rights. My experiences have manifested themselves in many way, but one of those ways is determination. I have come a long way from being an angry, misguided youth and a teenage parent who nobody thought would graduate. This is my second year in University. I currently hold a cumulative grade point average of 3.81 and during this past semester at UFV, my grade point average was 4.0.